Constituent Assembly, Roles and Responsibilities of Journalists 3-5 May 2007, Executive Summary National Media Development Center (NMDC) organized a 3-day training program on “Constituent Assembly, Roles and Responsibilities of Journalists” to the editors and senior journalists of Lumbin i Zone with the financial support provided by Department of Information. 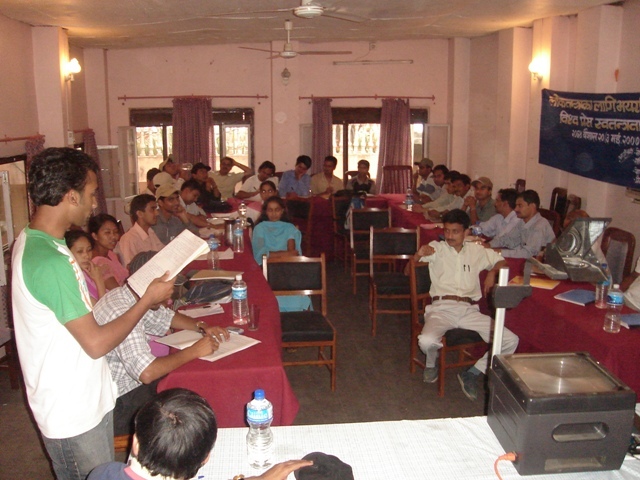 The training was organized from 3-5 May 2007 at Tansen, Palpa. In the training program, 32 journalists from five different districts- Rupendehi, Gulmi, Kapilbastu, Palpa and Syangja had participated actively. Among the participants, there were four women, four participants from ethnic minorities and one from dalit community. The main objective of the program was to intensify understanding of journalists regarding Constituent Assembly, and their professional role and responsibilities. Mr. Kashi Raj Dahal and Mr. Vinaya K. Kasajoo were the resource persons of the program. Group discussion and presentation made the participants more active. The participants expressed that this program made the journalists able to understand on the different aspects of constituent assembly and role of press. They have provided strong recommendations. The training session was started after the celebration of World Press Freedom Day. In the closing session, the resource persons distributed certificates to the participants. The local partner of NMDC were FNJ Palpa, Press Union Palpa and Press Chautari Palpa. NMDC President Mr. Bishnu Prasad Sharma Parajuli had highlighted the objective of the program. “NMDC is established for the empowerment of rural media and it will focus to enhance the reporting capacity of district journalists” addressing the inaugural session, NMDC president said.